The term ‘Cloud Computing‘ refers to the deployment of resources and applications on demand via the internet. It is possible to choose between various models, types of cloud provisioning and the appropriate cloud architecture. With Infrastructure-as-a-Service (IaaS) you no longer need to invest in expensive components of your IT infrastructure as you receive your IT resources from a virtual data centre. IaaS includes an immediately available infrastructure and establishes access to network capacities, memory instances and computing performance. The user maintains control over operating systems and applications. oneclick™ provides the complete IT infrastructure with the Cloud Resource Manager. Simply choose the suitable infrastructure from the various cloud providers and book yourself into a virtual data centre. You no longer have to invest into your own hardware and look after its maintenance. You save considerable resources through automated switching on and off of instances. This makes oneclick™ ideal for Public Cloud IaaS solutions, such as Microsoft Azure, IBM Bluemix, Profitbricks and Amazon AWS. A Platform-as-a-Service (PaaS) already includes all necessary resources of an IT infrastructure and builds on the scalability of an IaaS. Here Platform-as-a-Service can act both as a development environment, and serve the purpose of deployment and operation of applications. 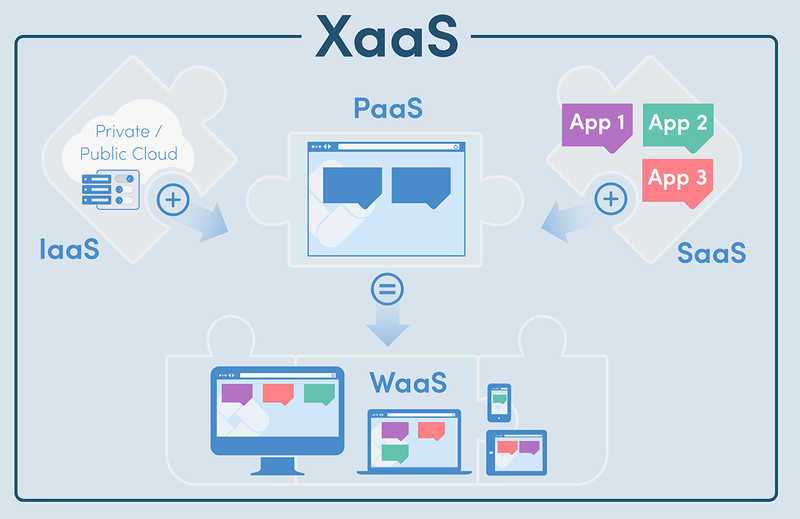 With PaaS, it is for example possible during deployment of applications to automatically provide computing power, memory, network, load balancing and databases. A Platform-as-a-Service also enables the administration and deployment of applications from a central platform. oneclick™ provides a complete platform for digital workspaces. Available 100% in the browser and as a service, the oneclick™ platform already includes all necessary components, features and modules for remote access. It provides the foundation for the integration of SaaS solutions and is the basis for the end user workspace. The term Software-as-a-Service describes applications, which are made available to the user directly from the provider for usage. Here the user no longer needs to think about the underlying structure, as all components necessary for the operation are covered by the Software-as-a-Service. Systems integrators, ISVs or managed service providers offer their applications as a Software-as-a-Service via the oneclick™ platform. For this, oneclick™ provides them with a platform, which allows the roll-out of their own applications and services to customers in a simple way. Workspace-as-a-Service allows companies to provide a work environment for their employees via a virtual desktop. This gives them access to all necessary applications and data at any time and from any location. For the end user, oneclick™ is an encompassing workspace, which contains all necessary applications and data for day-to-day work. Available as a service, oneclick™ connects every application and all data, which a user requires in one central location. The workspace also provides new opportunities for digitalisation of your company.